In the warm months stuff grows. While some of the vegetables we plant sometimes do not: usually a bug or borer of some kind gets to them, but the weeds survive. 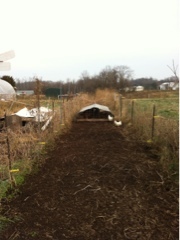 It can be frustrating to prepare an area that is clear, add compost, put seeds in and harvest little. The rewards come now, as the pigs eat every inch of everything that did not work, and as we reevaluate why. One year is never like another. Circumstances change: rain, sun, other farm commitments, building a commercial kitchen, growing birds to be the right size. Getting cattle to thrive on grass, locating the right amount of food waste for pigs, adjusting chicken pens to have the right amount of air and light without blowing away in high winds. The list is long, and in the early spring into the hot summer the predators are a constant night time battle, sapping energy from farmers who must save livestock. In the end, it is the pigs who are happy, the pigs who clear up and down into and including the roots of everything, weeds and all. They leave us a clean palate for next year, when we know we will scramble to beat the weeds again. No chemicals, but the pigs and egg layers are happy!